Why does the Vatican have an observatory? Can science and religion exist together? What really happened to Galileo? Does the Bible have anything to say about the Big Bang? Does science have anything to say about the Bible? And, oh yes, would you baptize an extraterrestrial? This is a very lively discussion, a dialog between two Jesuit scientists, a planetary scientist and a physicist, about Christianity, science, cosmology, conflicts and resonances between science and religion, and what questions each can address. Consolmagno and Mueller are both men of faith and men of science, people who felt called to the religious life, and to do science as part of that religious life. They're thoughtful, serious, and each has his own sense of humor and interests outside the realms of science and religion. The discussion of Galileo is detailed, nuanced, and supported by a fairly detailed chronology of the major events, scientific, personal, and political. 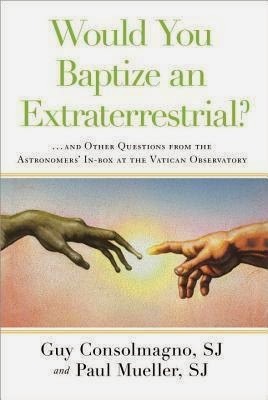 Without giving either man's answer to the question about baptizing an extraterrestrial, I will say that that discussion also goes in some interesting and unexpected directions. If you think that the Bible has to be read literally and doing otherwise is sinful, or if you think religion is nonsense that no intelligent person could take seriously, this is not the book for you. On the other hand, if you are interested in how two intelligent men who are both working scientists and members of a Catholic religious order think about these questions and about what they're doing both scientifically and as men of faith, this truly is a fascinating read, or listen.